In regards to these symptoms, they might appear for a few weeks to months and then disappear for a while. Rosacea is a tricky skin condition as many people mistaken it for acne, or an allergic reaction. But acne rosacea is separate and actually considered as a second type of rosacea. Although there isn’t a guaranteed remedy for Rosacea, there are certain treatments that have the ability to reduce the symptoms associated with rosacea and acne rosacea. Subtype 2 rosacea is referred to as “acne rosacea,” reflecting the belief that the two conditions are related. 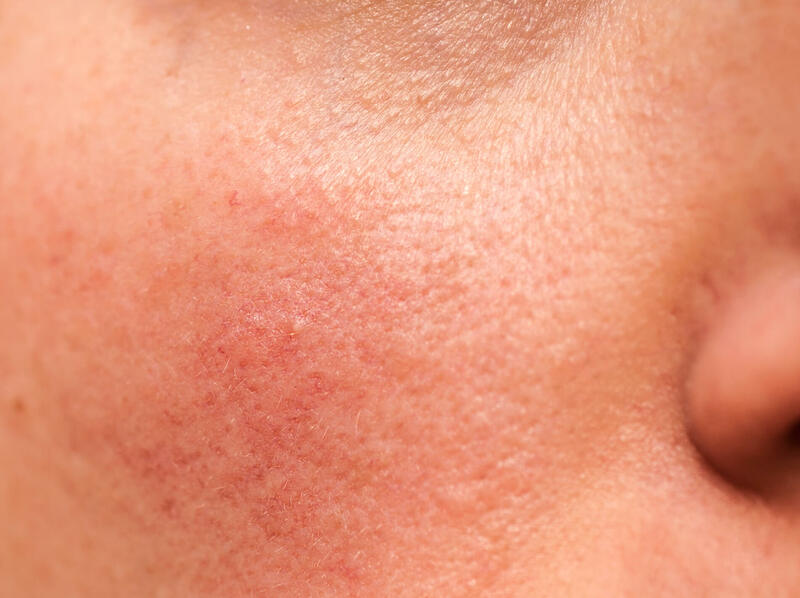 But this has often led to uncertainty with rosacea sufferers with bumps and pimples, as people may misguidedly self-diagnose themselves as having just acne. The two conditions require separate methods of treatment. Furthermore, acne medications may aggravate rosacea symptoms. The difference between acne and rosacea is that for rosacea, it occurs on the face, cheek and nose, and with acne is can also occur on the chest and back. In terms of the symptoms they are also distinct, as blackheads characterize acne. With rosacea, it is characterized by redness, inflammation and uneven pigmentation. 1) Facial redness is a common symptom of Rosacea. It normally causes relentless redness in the central part of the face. What alsohappens is that small blood vessels on your nose and cheeks start to swell and become visible. 2) Another symptom of Rosacea is swollen red bumps. Many people who have rosacea also get pimples on their face that bear a resemblance to acne. These bumps sometimes also contain pus. And lastly, you may experience the feeling of hotness on your face. 3) Lastly, many people who suffer with rosacea also encounter eye dryness, irritation, redness and swollen eyelids. One of the most commonly asked questions when using IPL (Intense Pulse Light) is if it effectively treats rosacea and how long will the redness stay away? Well the good news is that treatments like IPL can be very effective for the redness and flushing part of rosacea. IPL treats uneven pigmentations, broken capillaries, which are often referred to as ‘spider veins’, chronic redness, red scars and rosacea carefully and steadily. Remarkable improvements can be achieved for rosacea and spider vein removal, with slim discomfort. By nursing the blood vessels, the vascular reaction is reduced. Here at Mederm Esthetics & Laser in Vaughan, we have seen spectacular results for patients with rosacea. After several treatments their symptoms have vanished. It is important to note that the worse your rosacea is, the more treatments you will need for the best results. In addition, your genetic history, environmental exposure, diet and UV exposure is important to take into account in regards to improving rosacea in addition to IPL treatment. In addition there are things that can trigger rosacea such as emotional stress, wind, intense exercise, alcohol, spicy food and foods that contain wheat, gluten and sugar. Light therapy is another option for treating rosacea and spider vein removal. In fact, it may be a prime choice if you have small noticeable blood vessels on your face. Studies have shown that light therapy can diminish the appearance of facial redness, including on the nose and cheeks. With light therapy, it involves repeated treatments to sustain enhanced skin appearance. The positive side to light therapy is that the side effects are usually minimal. They usually consist of temporary redness, loss of skin color and bruising. At Mederm Esthetics & Laser in Vaughan we advise you to try light therapy if you experience persistent rosacea, as it can be an option for you. Over 17 million people in North America are estimated to have rosacea, so we consider it a prime skin issue to treat right away.